Homemade food gifts add a personal touch to holiday gift-giving. And they’re easy! I like that they’re consumable so there’s nothing to store after it’s eaten, and can be something new and fun for the recipient. Plus, it can usually be shared so it expands the gift! Glass jars are a clever way to package a variety of ‘recipes’. Cookies work well, layering the dry ingredients in the jar to be mixed later with fresh butter and eggs. 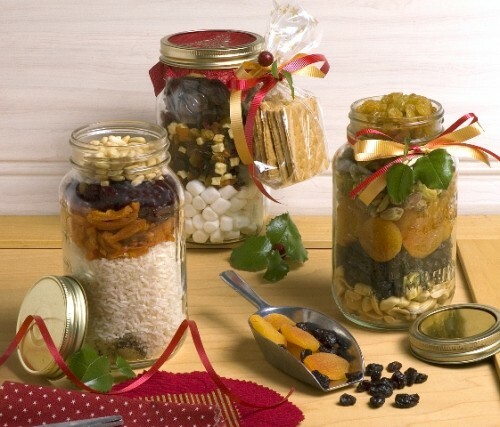 For Sun-Maid, I created three dried fruit gift jars: Fruity S’mores Bars, a play on the campfire treat but made into a cookie bar; Fruited Rice Pilaf, quick-cooking rice with herbs, pinenuts, dried apricots and cranberries; and a simple jar of good quality dried fruit and nuts layered attractively for a snack mix. My recipes are designed for 32-ounce mason jars (wide mouth style are easiest to fill.) Or use any shape jar or crock, even a 26-ounce pasta sauce jar can work if ingredients are packed tight. There are also lots of recipe ideas on the web for gift jars. Have fun with it! Mix first 4 ingredients in bottom of a 26-32 ounce size glass jar. Pour rice over spice blend. Layer separately the apricots, cherries and nuts over rice. Pack fruit to fit in jar if needed. Close jar and decorate. Cooking Instructions: Bring 2 cups water to a boil. Add entire contents of jar. Cover and let stand 5 minutes. Fluff with a fork and serve. Note: Instructions are for 2 cups of quick-cooking rice. Adjust cooking time and amount of water according to rice package directions. Layer marshmallows and fruit bits in a 26-32 ounce size glass jar. Pack chocolate chips in a plastic sandwich bag and place on top of fruit. Close jar. Pack graham crackers in a plastic bag and tie to lid with ribbon. Combine chocolate chips and 2 tablespoons peanut butter in a microwave-safe bowl. Heat on medium power 2-3 minutes; stir until smooth. Stir graham crackers, marshmallows and fruit bits into chocolate mixture until evenly coated. Press evenly into an 8×8-inch pan. Refrigerate 45 minutes or until set. Cut into squares. Click here for a photo of finished bars. Recipes by Rosemary Mark for Sun-Maid. Photography by Kelly Burgoyne.